Here is a peak at the second release of the Trilogy Project. 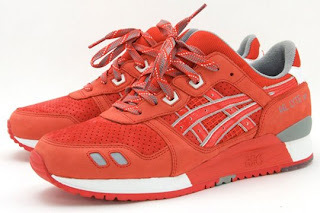 The second feature is the Asics Gel Lyte III x Nicekicks collaboration. The shoe features an upper of varsity red premium leathers, perforated pig skin, ballistic mesh and woven laces. The release is limited to 250 pairs and will release exclusively at Davidz in October.